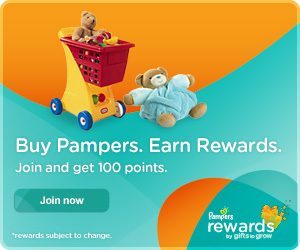 Pampers Gifts to Grow: 30 More Points! You are here: Home / FREEbies / Pampers Gifts to Grow: 30 More Points! Ready for some more points? You can add 30 more points to your Pampers Gifts to Grow account. Just go HERE and 10 points will be added to your account. If you don’t see them right away, check your points history and you should see the added points. You can also enter code FB999CNEKJRKN14 for 10 points. And, click on the link in this Facebook post for 10 more points (code expires 2/19)!